Aberdeen's Sam Cosgrove celebrates putting his side 1-0 up with Graeme Shinnie and Lewis Ferguson (L). Sam Cosgrove took his tally to 20 for the season with a brace in Aberdeen’s 2-0 win over Dundee. An uneventful first half suggested this would be a potential slip-up for the Dons but Cosgrove’s penalty and then a further on 77 minutes sealed the victory. The three points ensure the Dons go into next week’s Scottish Cup semi-final against Celtic with back-to-back wins. Greg Stewart came in for Dean Campbell, who has a foot injury, in the only change for Aberdeen from the 3-1 win over Motherwell. Dundee were desperate for the points to get off the bottom and were nearly gifted an opening by Dominic Ball, who ceded possession cheaply to John O’Sullivan but the winger could not pick out any of the three dark blue jerseys in the box. 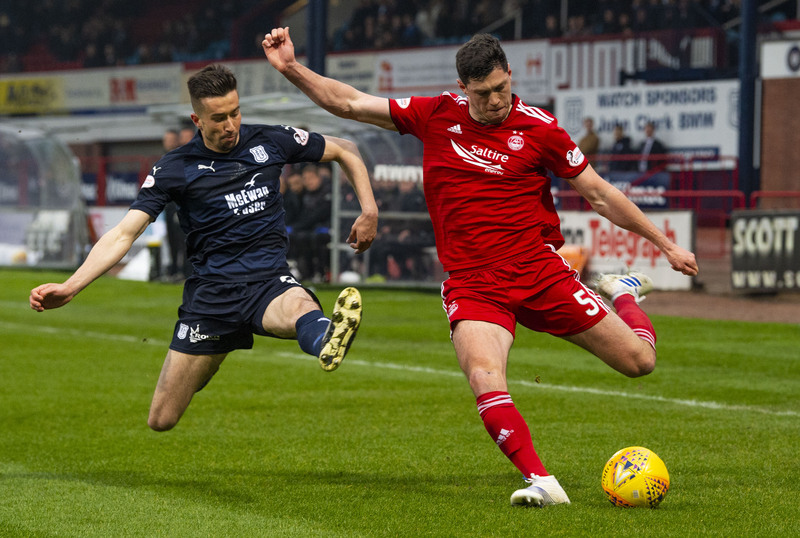 Aberdeen’s Scott McKenna (R) in action with Dundee’s Cameron Kerr. 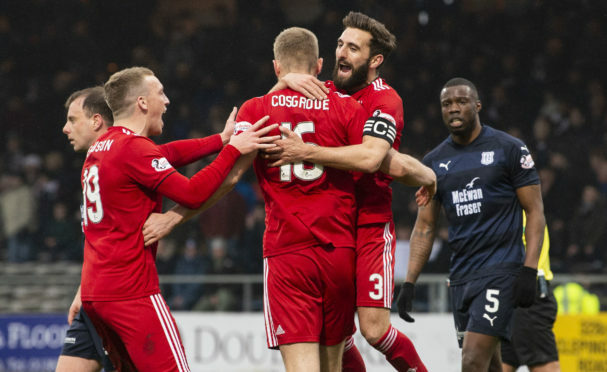 Aside from a rare Scott McKenna foray forward, Aberdeen struggled to put any real pressure on a Dundee side who were feeling the frustration of their own support. Craig Curran struck a wild potshot over from 30 yards and finally with nine minutes to go in the half there was a strike on goal, with Ethan Robson hitting the outside of the post from the edge of the box. The Dons had a penalty appeal turned down three minutes before the break after Connor McLennan’s cross looked to be blocked by the arm of Paul McGowan. However, referee Andrew Dallas was unmoved. A further shout for a spot-kick was waved away by Dallas as Greg Stewart’s cross was palmed by Senny Dieng straight at Genseric Kusunga inside the six-yard box. 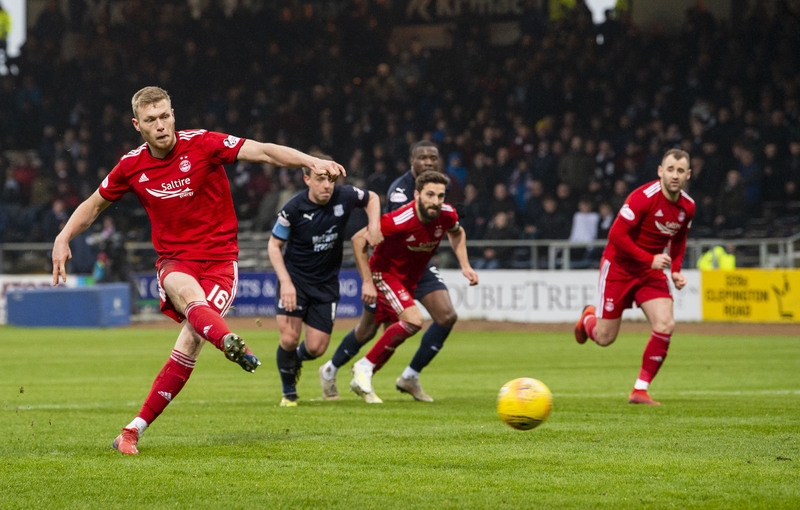 Dundee were growing in heart in the second half and teenager Callum Moore was denied a first senior goal by Lewis Ferguson’s lunging block. John O’Sullivan’s long-range shot had to be tipped over by Joe Lewis as the home side pushed for an opener. Sam Cosgrove rolls home the penalty. On the counter-attack Aberdeen finally managed to get themselves in front when Ferguson was chopped down by Moore in the box. Cosgrove stepped up to send Dieng the wrong way from the spot for his first goal in five games. Cosgrove got his second with 13 minutes to go after great work by McLennan down the left-hand side, beating his man twice and pulling back for the big striker to finish from six yards. McLennan was unlucky not to add a third for the Dons but Dieng sprang to his right and clawed away his shot, at the end of an ultimately fruitful afternoon for the visitors.